This collar is already made and ready to ship. It fits neck sizes 18-26 inches. 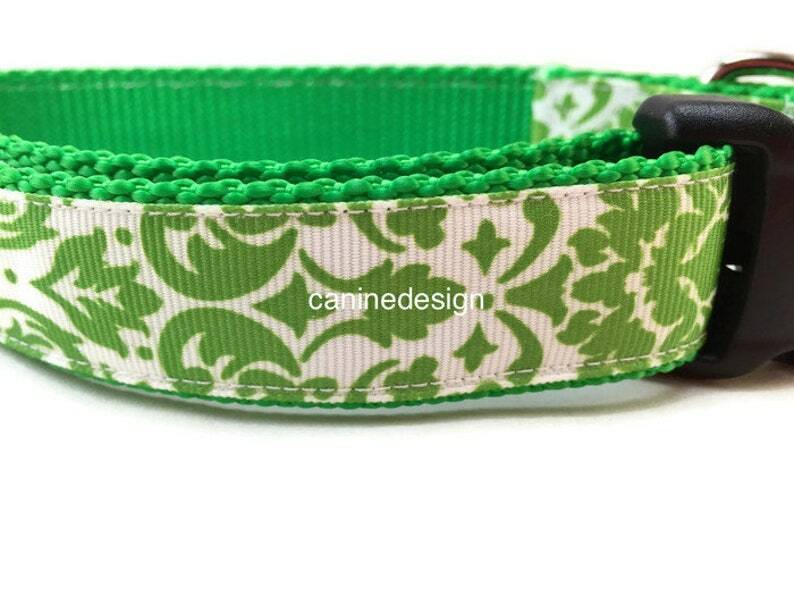 1 inch wide, adjustable, martingale style. Made with heavy nylon and grosgrain ribbon. For size guides, fundraiser and rescue information, and other FAQs, please see our blog! 10% of your purchase will benefit a monthly animal rescue. Follow Caninedesign on social media for contests, giveaways, and special sales! Very cute. Arrive on time as pictured. These are the latest collars in Oreo's collection. I have ordered 16 collars from Laura ranging from those she offers in her shop plus several custom orders. Linda is fantastic. Her collars are well made, tough and easy to launder and her customer service is wonderful. I love this site and will continue to be a returning customer. Thanks so much Laura. I appreciate your time and fantastic service. Every single purchase at Caninedesign is made-to-order. You can choose collar type, leash length, nylon color, size...even change out the buckles. Because each order is unique, I don't do returns or exchanges for sizes, type, or color. I will do a return if you are unhappy with the quality. Yes! I do wholesale. Prices are 50% off retail. Your first order has a minimum of $150. Shipping is medium priority rate box ($12.65). Please note my buckles are branded with my logo. Pick out what collars or leashes you'd like, size, and type, then contact me. We ship to the address on the order, no exceptions. If the order was placed with the wrong address, we can cancel the order, give you a refund, and ask you to place it again with the correct address. Artisan Sewing Academy, Boyds, Md.